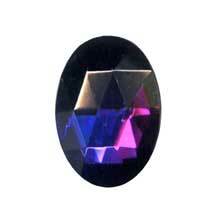 Faceted glass cabochon measures 25x18mm in diameter. This is a very unusual piece. Depending on which way the cab is turned it changes color from blue to purple and purple to blue. This piece is gorgeous!